MudSmith gauge tires are 40% thicker, for 20 – 80% longer life. 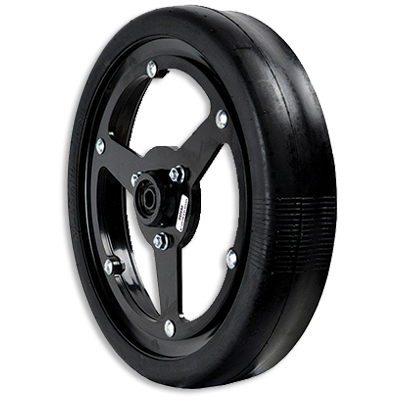 Gauge tires are semi-pneumatic, and pliable compared to some of the rock-hard ones on the market (more sidewall compaction). Super-rugged rim and hub. Available in 4.5″ and 3″ widths. 2.5” are also available, but are not semi-pneumatic—they’re rock hard—and we discourage using them on any soils where compaction is a concern. Mudsmith has become the go-to brand of open-rim gauge wheels in North America because of their highly robust, quality construction. Their open-rim design has proven to be excellent for shedding mud. The rubber in MudSmith tires is thicker and lasts longer than other brands, yet they still have a softness or pliability to cushion the soil (unlike some brands that are rubber but have little or no air cavity, and are hard as a rock). MudSmith gauge wheels are available with 3 different bearings to match your planter: bolt-thru, roll-pin, and set-screw types. Gauge-wheel drills, such as JD’s 50/60/90/Pro, Case’s PD-500, New Holland’s P-2080/2085, and Case’ SDX, use bolt-thru type bearings. 20% more wear-life than the next-best, which is our old standby from Ingersoll-Canada. The Forges de Niaux takes it to the next level with a unique steel and special heat-treat process. Same dimensions as OEM. Valion seed tube guard w/ wings, rivets, bolts; for pre-XP and Kinze 2000s. Sleeve, bushings & seals for closing arm’s pivot, JD 50/60/90 drills (excluding earliest 750s). Chromed steel sleeve is 86mm long for 50/60/90s (doesn’t fit the earliest 750s).